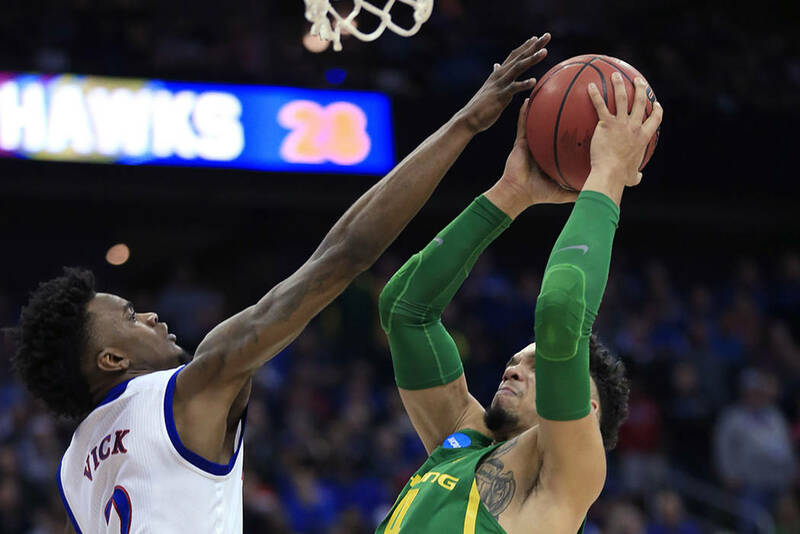 Tyler Dorsey poured in 27 points, Dillon Brooks added 17 and plucky Oregon ended Kansas’ romp through the NCAA Tournament with a 74-60 victory Saturday night that gave the Ducks their first Final Four trip in nearly 80 years. KANSAS CITY, Mo. 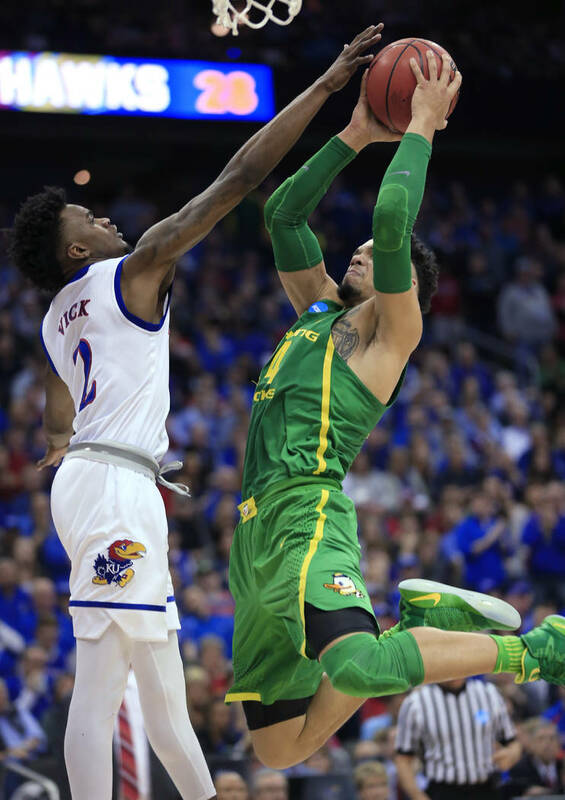 — Tyler Dorsey poured in 27 points, Dillon Brooks added 17 and plucky Oregon ended Kansas’ romp through the NCAA Tournament with a 74-60 victory Saturday night that gave the Ducks their first Final Four trip in nearly 80 years. Dylan Ennis added 12 points for the Ducks (33-5), who took the lead with 16 minutes left in the first half and never trailed again, giving coach Dana Altman his first trip to the national semifinals. They’ll face the winner of Sunday’s game between North Carolina and Kentucky in Glendale, Arizona. Player of the year front-runner Frank Mason III had 21 points in his final game for the Jayhawks (31-5), who had rolled to the Elite Eight by an average margin of 30 points. But their dream season ended with a thud just 40 minutes from campus on a night where very little went right. Star freshman Josh Jackson was mired in early foul trouble. Sharpshooting guard Devonte Graham never got on track. And the swagger that the Big 12 champs showed in humiliating Purdue in the Sweet 16 quickly became a distant memory on a night that belonged to the Pac-12 champions. Altman had never been to the Final Four in 13 appearances in the NCAA Tournament. And the last time the Ducks were on the big stage, it was 1939 and the Tall Firs took home the title. 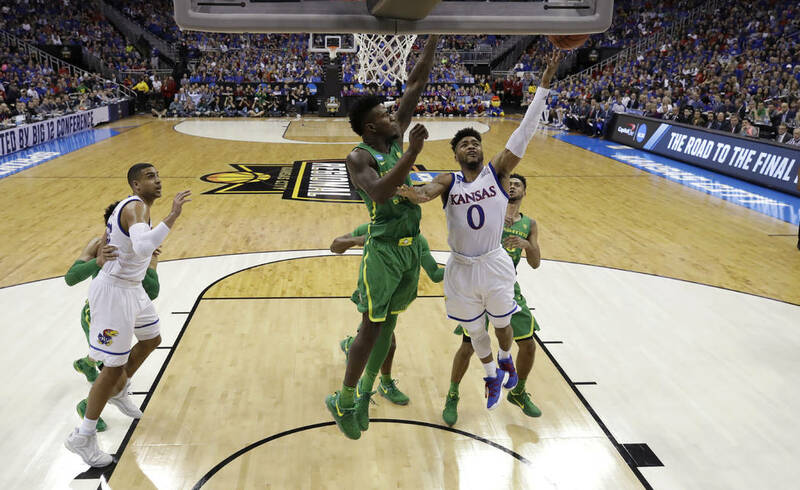 Jordan Bell added 11 points, 13 rebounds and eight blocks for Oregon, while Jackson was held to 10 points for the Jayhawks in what was almost certainly his final college game. The bus carrying the Ducks to Sprint Center on Saturday passed right by the Power and Light District in downtown Kansas City, where thousands of Jayhawk fans were rallying hours before the tipoff. In other words, they knew they were facing a de facto road game. But the torrid shooting of Brooks, Ennis and Dorsey quickly riled up the small section of Oregon fans while deflating the rest of sold-out Sprint Center. And foul trouble that sent Jackson to the bench for much of the first half helped allow the Ducks carve out a comfortable lead. Dorsey finished the half with back-to-back 3s, including a deep bank shot at the buzzer, as the Ducks pranced to their locker room relishing in a 44-33 advantage. They kept right on dancing in the second half, beating the Jayhawks at their own game: Getting into transition, passing up good shots for better ones and knocking down 3-pointers. The Ducks’ lead swelled to 55-37 when Brooks drilled another shot from the perimeter, creating the kind of hole Kansas has rarely faced. And the frustration was on the Jayhawks bench was only compounded every time Jackson or Graham tossed up a shot that clanked hollowly off the iron, their sense of desperation growing with every squandered opportunity. Jackson didn’t score until midway through the second half. Graham was 0 for 6 beyond the arc. The Jayhawks eventually began to whittle into the deficit, doing most of the work at the free-throw line, where they were in the bonus with 11 minutes to go. But the Ducks remained poised down the stretch, answering just enough times to keep the crowd from giving Kansas any extra juice. When Svi Mykhailiuk scored to make it 64-55, Ennis answered with a driving basket. When Mykhailiuk buried a 3 from the corner to make it 66-60 with 2:49 left, Dorsey answered at the other end with another 3-pointer as the shot-clock expired to give Oregon some breathing room. The Ducks never even bothered with free throws to put the game away. Oregon wound up shooting 51 percent from the field and hit 11 of 25 from beyond the arc. It’s the kind of torrid shooting that has derailed the Jayhawks several times this season. Kansas also lost in the regional semifinals a year ago, and the round has quickly become the biggest source of frustration for Jayhawks coach Bill Self. He even alluded to the problems on Friday, saying the round is “probably the hardest” in the entire tournament. The Ducks are headed to the desert to play for a spot in the national championship.